Northbrook, Illinois – Northbrook Court Dental Associates (http://www.northbrookcourtdental.com) has announced that it is offering periodontal therapy to help reverse damage from gum disease. According to a 2012 study conducted by the Centers for Disease Control (CDC), approximately one out of every two adults over the age of 30 suffer from some form of gum disease (periodontitis). Periodontal disease is caused by plaque and tarter buildup in the mouth. Plaque is a yellow film of bacteria that adheres to the teeth. The bacteria comes from food and other organic matter. Plaque can usually be removed with regular brushing and flossing. However, if it remains in the mouth for long periods of time, it hardens into tartar. Once plaque has turned into tarter, it can only be removed by a dentist or hygienist. Gingivitis is the start of periodontal disease. Symptoms include red, swollen and bleeding gums. As the disease progresses, the tissue surrounding the teeth begins to pull away, resulting in loose teeth and eventual tooth loss. Between 80 to 90% of all U.S. teens currently have some form of gingivitis. Periodontal therapy includes scaling and root planing. Scaling is the process of removing plaque and tarter above and below the gum line. Root planing eliminates any remaining bacteria on the tooth’s root. If there has been significant bone and tissue loss, dental surgery may be also be necessary. For more information on periodontal disease and Northbrook Court Dental Associates’ treatment services, visit the Northbrook dentistry office’s website at http://www.northbrookcourtdental.com, or call the office today at 847-272-2900. 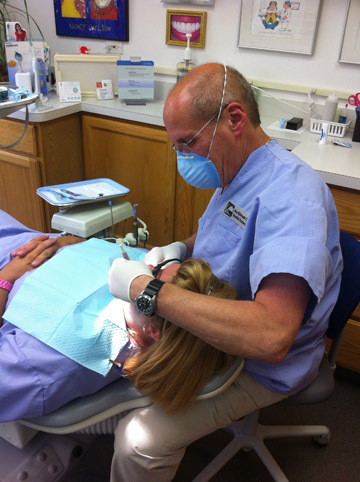 Dr. Michael Vold has a Bachelor of Science degree from the University of Wisconsin (1963), a Doctor of Dental Surgery degree from Northwestern University Dental School (1967) and a Juris Doctor degree from DePaul University College of Law (1980). He served as a dentist in the U.S. Air Force and taught as an Assistant Professor at the University of Illinois, College of Dentistry. Dr. Vold is a member of the American Dental Association and Illinois State Dental Society, as well as a recipient of numerous professional honors and awards.